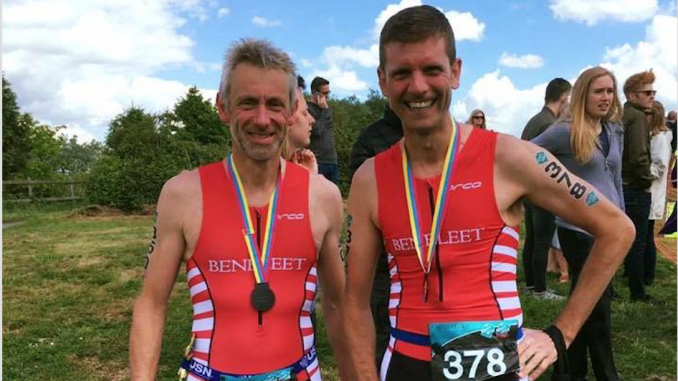 Paul Ruffy and Richard Jones triumphed at the Hanningfield Standard Distance Triathlon at the weekend. Taking on the all round rigours of a 1500m swim, 36km bike ride and 10km run, Ruffy qualified in 3rd place with a time of 2:03:59 and Jones came in 14th position, crossing the line in 2:18:16. Dennis Dudley also conquered the course in 2:29:34. Graham Booty rose to the herculean challenge of the Guernsey Ultra. Navigating 36 miles of cliff paths and coastal climbs, the club runner went on to win the race in a time of 5:34:26. Despite the rugged terrain, Benfleet Running Club gave a sure-footed performance at the Roach Valley Way Relay, with ‘wrong direction’, comprised of team members Eddy Copper, Terry Spooner, Pete Stalley and Andrew Low – collectively topping the scoreboard. Qualifying in 13th place was ‘2 roses and 2 thorns’ made up of Kerry Williams, Mandy Cooper, Ian Cadwell and Peter Stalley. Next BRC team in was ‘Worst Case Scenario’, helmed by runners Duncan Holland, Ann Reed, Audrey Morris and Pippa Baillie. ‘Oliver’s Army’, consisting of John Chaffin, Sue Horton, Lynda Crisp and Bobbie Oliver also competed.